This is a special service which involves bringing your child to the front of church (together with any other members of your family or godparents/sponsors who wish to come). The minister will ask you to declare the name you have given to your child and will then thank God for him/her and pray for His blessing on you, your child and the whole family. Thanksgiving is different from baptism because it does not require you to make any public statements about your Christian faith or promises about how you will bring up your child. It is ideal for those who want to express gratitude for their child without making promises that they may not be able to keep. It can be followed by baptism at a later date if appropriate. Baptism does not make anyone a Christian. It is a symbol of what Jesus did for us – that he died to wash away the sins of those who believe in Him, and rose from the dead to be our Lord and give us new life. Just as whole families were baptised together by the apostles, so today it is appropriate that both adult Christian believers and their children are baptised – on the understanding that children will be brought up as Christians within the church family. 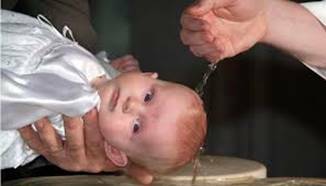 Baptism again involves coming to the front of church with your child and godparents, and publicly declaring the Christian faith which you yourselves believe, and then promising to bring up your child in that Christian faith within the church family.